Remember Phsiris? He’s already surprised listeners with daring forays into hi-tech, psybreaks, and glitch—and now he’s back with a collection of tweaked out progressive gems on the indomitable Insonitus Records. 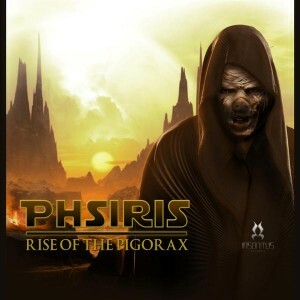 Rise Of The Pigorax, the third release from Australian producer Phsiris, explores the darker realms of progressive psytrance with a twist, blending jazzy melodic flourishes with super-grooving bass lines made to melt your face. Mastered by Anti-Logic, Berlin with artwork by Clint Grierson @ Point Zero Productions. MP3 Download | FLAC Download | WAV Download · Download count: 5,698. Very cool. Dark & twisted with a non-compliant theme throughout. Not your typical dark psy. Invloving psy breaks is a nice touch too. Nice ep! Some epicly twisted sounds bouncing and morphing around in there, a treat for the senses! Nice sound design and structure, really like the break in From the Shadows, also! the audio quality is exellent oO, the composition too, nice Ep, thanks ! Very strong tracks. Nice atmosphere, much like your last high-tech release. Some unique sounds in here. The whole concept of “From the Shadows” is great. Very expressive and nicely different.